The following questions were asked on reading textbook chapters and reviewing presentations on circuit analysis and previewing presentations on advanced electricity concepts. "Learned about voltmeters and ammeters." "I learned more in-depth the differences between a series wiring and a parallel wiring. Series wiring is when the same electric current runs throughout all the devices. While a parallel wiring is when the same voltage difference is applied to all the devices." "When measuring the current passing through a light bulb (or any other circuit element), the current that passes through the light bulb must also pass through the digital multimeter. This means that the wiring in the circuit must be 'broken' open to connect the digital multimeter to measure current (making it an ammeter)." "An ammeter needs a resistance of zero or nearly zero to measure current. While a voltmeter needs a resistance that is nearly infinity to measure the difference in electrical potential." "A voltmeter is used to measure (delta) V in devices and instruments. The wiring is altered to allow flow through the voltmeter and an instrument such as a light bulb." "An ammeter has an ideal resistance of zero and is used to measure the current going through a light bulb. A voltmeter measures the electrical potential energy used by a light bulb and has a ideal resistance of infinity." "'Twinkle twinkle little star, quals I-squared r.' Circuit breakers are designed to prevent runaway circuits from causing damage." "That with more resistors are added in parallel to a circuit the equivalent resistance decreases. This can result in a very large runaway current." "Joule heating is the rate of power used per time. As more appliances are plugged in overall resistance decreases in the house which can lead to a dangerous runaway current." "Joule heating is the term for the rate of energy used per time used by a circuit element of resistance due to the amount of current I flowing through it. For each charge q that uses a certain amount ∆V of electric potential, the amount of electric potential energy used is ∆EPE = q·∆V." "When more devices are connected to a voltage source in parallel, the resistance decreases and the current increases. This can be a safety issue in household wiring, which is somewhat mitigated by circuit breakers that cut off electricity when the current gets too high. An ammeter measures current, while a voltmeter measures voltage." "Distinguishing between the resistance of ammeter and voltmeters." "How an ammeter works. I'm not sure why it should have such a low resistance while a voltmeter should have high resistance." "What the difference is between ammeters and voltmeters. I mean why does ammeter have a resistance close to zero and why does a voltmeter have a resistance close to infinity. Also in what situations would I use a voltmeter over an ammeter (or vice versa)?" "Voltmeters and anmeters. Review on how these work and how they are different would be great." "I am struggling with the parts about the voltmeter and ammeter and their specific uses." "I do not know what an ammeter is. I do not know the physics behind electrical units." "How power dissipation fits into everything." 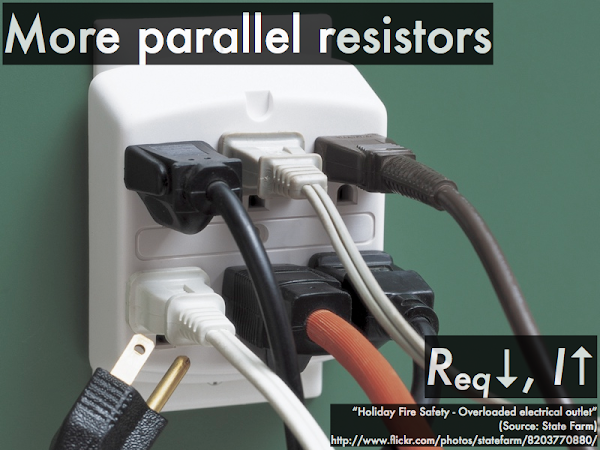 "Clarification on why more resistors will cause an outlet to become 'overloaded'. Why does low resistance cause the wires connected to the outlet to heat up?" "I'm still not exactly sure how a circuit breaker works/how it prevents too much current." "How the power dissipation equation is constructed, but I need to see more examples of when and what context we use it. Also, how do circuit breakers work? I don't think I understand that." "I did not find too much confusing. Just heavy information-wise, and a lot to understand." "I have not found anything confusing." What are the resistances of these (ideal) devices? Determine what will happen to the following parameters when additional electrical appliances are plugged in and turned on in the same household circuit. A fuse or circuit breaker is designed to prevent too much __________ in household wiring. "Can we go over a brief overview of electricity I forgot a lot of the material? That's on me, but a review would be nice." "Please go over the examples above thanks!" "Not too many questions, except for the ammeter vs. voltmeter parameters mentioned above." "I learned that many videos shown in class shouldn't be attempted at home."